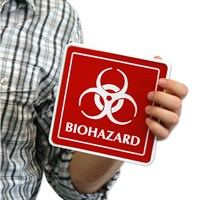 Contents Each sign comes with complimentary adhesive strips for easy installation onto a door or wall. Other mounting options can be found below. Choose professionally engraved signs for a unique look in safety signs. These signs are available for quick shipping. • This sign has either white or black letters on a bold, contrasting background. Select your desired color; each edge of the sign is distinctively beveled.